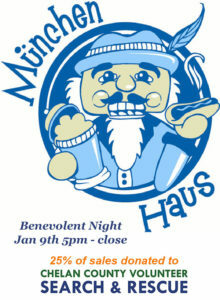 25% of all sales from 5pm to close will be donated to CCVSAR. All ages are welcome. Come meet the people and dogs of CCVSAR and enjoy some great food & drinks. We will have a raffle with some great items donated by our local sponsors. Please download our fliers and help us place them around the town.